Airbnb Experiences just launched in the party capital, Goa. With this, let local experts host you for unique activities and take you on guided walks and introduce you to communities you would’ve otherwise missed. We tried one of them and here’s a sneak-peek to what you can expect. Some Goan Tapas With Nolan? Located in Sangolda, Moki is a rooftop bar and kitchen in where we headed straight to the 4th floor to be welcomed by soothing fairy lights and bunch of photos of cheerful visitors from the past. This wall of memories already had us charmed, but what the host, Nolan Mascarenhas, had in store was even better. Although the official name of the experience, Goan Tapas With Nolan, hints only at the array of delectable Goan tapas that Nolan (along with his chef) had created for us, we can’t gush enough about the potent and delicious cocktails he paired the food with. Each course had a story behind it (like the Lazy Suzie, inspired by his dog as well as his grandma who gave him iced candies when he was young). Nolan will also keep you laughing and attempting to answer all of his interesting trivia questions while giving you an insight into the vast knowledge behind each of his dishes. We couldn’t pick any one drink or dish from the five courses as our favourite because all of them were just that good! But, we say, don’t miss the dessert, the 6 E Goan (it reminded us of Tiramisu, only with Jameson Whiskey) served with Allebelle Cigars which were crunchy to perfection and filled with salted caramel sauce and kesar cream. The setting of the bar itself, with a gorgeous lush view and gentle breeze through your hair, will add a magical charm to the entire experience. You can book this one here. Airbnb left us impressed with just a preview to the multiple experiences they have to offer. 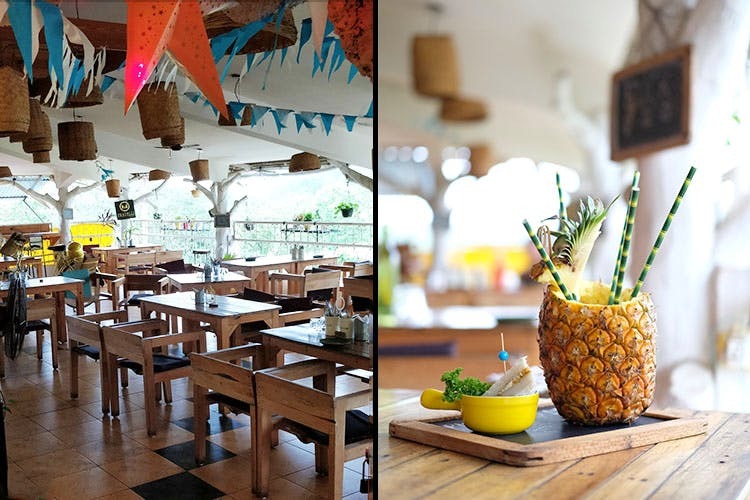 We’re guilty of picking the ones that involve food, anecdotes and a breezy rooftop bar. Just saying. There are also heritage walks, classes and workshops, experiences related to art, culture, parties and more. You can scroll through them and book the one that interests you here.